Hong Kong’s debates over universal suffrage reflect a larger identity crisis in the Special Administrative Region. While UK Prime Minister David Cameron’s visit to China has mostly gone as planned, one critical article appeared in the Global Times. The editorial called Cameron’s “sincerity” into question, specifically taking the UK to task for “making carping comments on Hong Kong implementing universal suffrage for the chief executive’s election in 2017.” Cameron’s visit, which has been focused almost exclusively on trade, suddenly became connected to a larger and much thornier issue — the question of Hong Kong’s universal suffrage. Currently, Hong Kong’s chief executive is elected by a committee of 1,200, rather than by a direct vote. In 2007, China’s National People’s Congress Standing Committee decided that “that the election of the fifth Chief Executive of the Hong Kong Special Administrative Region in the year 2017 may be implemented by the method of universal suffrage,” with universal elections for the Legislative Council to follow. While this decision gave hope for direct elections of the chief executive by 2017, it also doesn’t provide a guarantee. As 2017 gets closer, the debate over whether to implement universal suffrage and how to do so has grown more intense. Rather than focusing on the election itself, much of the debate has centered on how the nominations process will work. Article 45 of Hong Kong’s Basic Law says that the “ultimate aim is the selection of the Chief Executive by universal suffrage upon nomination by a broadly representative nominating committee in accordance with democratic procedures.” The controversial section is the latter half: what will this “broadly representative nominating committee” look like? Pan-democracy activists in Hong Kong fear that the nominating committee will be full of Beijing loyalists, meaning that only pro-Beijing candidates will be allowed to run for chief executive. Zhang’s question reveals the anxiety underlining the democracy debates: Hongkongers, especially the pan-democrats, fear losing their unique identity and being subsumed into China as a whole. Some Hong Kong citizens are thus incredibly sensitive to any signs that Beijing is interfering in the city’s affairs. Meanwhile, the Chinese government worries that Hong Kong is increasingly pulling away from it, and as a result Beijing tends to see Western-backed, pro-democratic conspiracies around every corner. Sensing an increasing distance between Hong Kong and the mainland, Beijing rolled out a plan to incorporate “moral and national education” in Hong Kong schools. This attempt to instill a love of mainland China into Hongkongers backfired with a vengeance. Last year, tens of thousands of Hong Kong residents protested the new education requirements, which were finally scrapped as a result of public pressure. On the other side of the debate, mainland scholars and government officials feel, as Zhang Dinghuai puts it, that Hongkongers “haven’t given due attention to how to fulfill the region’s political responsibilities to the country.” Instead, they focus exclusively on China’s responsibilities to Hong Kong. Beijing sees the return of Hong Kong in 1997 as a shining moment in Chinese history, and resents that some Hongkongers seems less than enthused about being joined with the mainland. As with other cases of domestic dissent, Beijing often finds it easier to blame the problem on a Western conspiracy rather than acknowledging legitimate grievances. Thus the Global Times’ shot at British PM David Cameron. Western politicians certainly aren’t doing themselves any favors. Just in the past three months, both a UK Minister of State and the new U.S. consul general to Hong Kong have expressed their support for universal suffrage in Hong Kong. 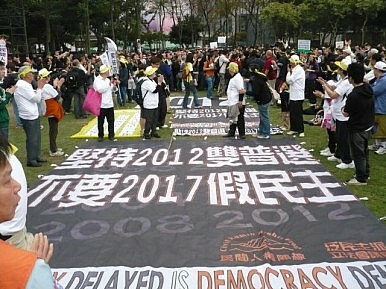 In response, Chief Executive Leung issued a warning: “For any foreign official who wants to participate or intervene, the past experience is very clear – it will only do the opposite for Hong Kong’s political reform, including the people they wanted to support or influence.” The more Beijing sees Hong Kong’s democracy advocates as Western pawns, the less likely we are to actually see universal suffrage in the region. At any rate, cultural questions aside, the South China Morning Post writes that there is a purely legal “catch-22” with regards to the 2017 elections. Beijing’s Basic Law Committee Chairman Li Fei warned that “Hong Kong faces a dilemma: it cannot elect a chief executive opposed to Beijing, nor can legally qualified candidates be barred from running when the city chooses its leader by one-person, one-vote in 2017.” Unfortunately, Li did not offer any solutions to the dilemma, leaving the debates to rage on. Details of the draft suggest Beijing is holding to a hard-line stance in the face of pan-democrat opposition.